Waking up on a Saturday at the same time I do during the week is hard! Sometimes it’s needed. Today is one of those times. I’m on my way to the MCM Manchester Comic Con. 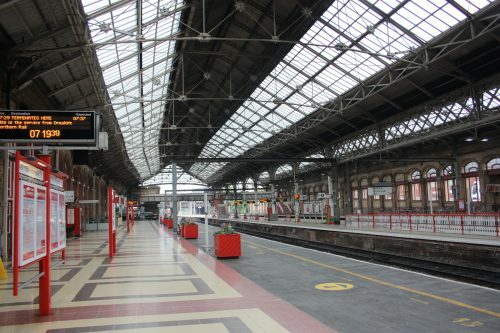 Held at Manchester Central [aka GMEX]. Not only that, it’s the first day for six weeks that there is disruption on the main Preston to Bolton line. The main artery for trains between Preston and Manchester. I don’t need to worry as I am quite a seasoned traveler on that line. It’s a journey that I’ve been doing for a couple of years on the way to work. I’m expecting a load of Cosplayers. People who dress up as their favourite character. Be that from a cartoon, comic book, film, computer game or television series. I don’t know what to expect or who to see. If I can get half of who people are I will be quite amazed as I don’t tend to watch a lot of, modern, Japanese anime. I’m stuck in the 90s with Ghost in the Shell or Read or Die. I’m better with film and television ‘tho. Some Marvel and DC characters I’m quite good at as well. I’m sure that I’ll be asking some stupid questions to the cosplayers themselves like “Who are you“. That, for me, is half the fun. Learning about the people and who they have come dressed as. Whilst on the platform waiting the train I got chatting to some of the people who were in costume and waiting for the same train. I was told that I would either love or hate the show. Hopefully, it’ll be the former. I was given some other pieces of advice about the panels and what cosplayers to look out for. The 51st Regiment [ Star Wars ] should be spectacular. Some of the other costumes should be spectacular as well.